ABSTRACT: Upon accession to the WTO, China committed to a series of specific obligations often referred to as “WTO+,” aimed at the progressive transformation of the Chinese legal landscape. While one cannot ignore a number of very significant achievements as well as a true political responsiveness to other WTO members’ concerns, China has not been willing to grasp the WTO opportunity for domestic legal reforms as much as observers, and some Chinese leaders, had hoped for. This incomplete normative revolution now creates tensions between WTO members, as evidenced by an increasing number of disputes shedding a direct light on the lack of transparency in the Chinese legal system. Ten years later, this piece reflects upon predictions about Chinese “rule of law by internationalisation,” while putting China’s legal reform into a broader political perspective. KEYWORDS: China, WTO, legal reform, rule of law, internationalisation. ABSTRACT: Since 2001, China has, overall, respected the commitments it made when it joined the WTO. However, no “WTO spirit” has been observed that might have led it to go beyond the letter of these commitments, and very many non-tariff barriers are still in place. In view of the modernisation of its legal framework, is there room for improvements that would enable foreign companies to find their place more easily in a rapidly expanding market, or do structural obstacles stand in the way of the developments hoped for by its main partners? KEYWORDS: China, WTO, market access, foreign investment, non-tariff barriers, rule of law. ABSTRACT: China is without a doubt the world’s leading infringer of intellectual property rights (IPRs). China’s factories produce counterfeit and pirated products for local and foreign consumption while China’s domestic industry infringes patent rights with relative impunity – this despite nearly 30 years of improving laws for the protection and enforcement of IPRs as well as accession to the World Trade Organization in 2001. This brief article seeks to understand the reasons behind China’s apparent failure to adequately enforce its IPRs. Finding local protectionism a major impediment to enforcement efforts, the article further analyses whether the central government has the power to enforce IPRs or whether it is powerless to confront and challenge local interests. KEYWORDS: intellectual property, counterfeiting, piracy, enforcement, local protectionism, WTO. ABSTRACT: This essay analyses the official and media response to the WTO cases related to cultural products, which China lost. It aims to contextualize both the official discourse and the press discourse in terms of domestic politics and China’s trade priorities. It concludes that in the official discourse, China and the US are working at cross purposes, as they have fundamentally divergent concepts of trade in cultural products. The newspaper discourse is more moderate and emphasises developmental and commercial issues, but is also subject to the priorities of Chinese politics. KEYWORDS: China, WTO, cultural trade, intellectual property rights, political discourse, press. ABSTRACT: The interaction between trade and health objectives has assumed critical importance for China since its accession to the World Trade Organization (WTO). The wish to improve its access to foreign markets has had a visible impact on China’s food safety policy, providing significant impetus for far-reaching reforms. The WTO Agreement on Sanitary and Phytosanitary Measures (SPS Agreement), to which China is now bound as a WTO Member, sets out a “best practices” regulatory model with which national food safety regulation must comply. The disciplines it entails on regulatory autonomy in the area of food safety may present considerable challenges for China but have the potential to promote rationality in such regulation and to prevent food safety regulations that are based on unfounded fears or are a response to protectionist pressures from the domestic food industry. Faced with the possibility of challenges by other WTO Members to its food safety measures on the grounds of non-compliance with WTO rules, China has a strong incentive to improve conformity with this regulatory model, bringing benefits not only to exporters but most importantly to its citizens. KEYWORDS: Food safety, WTO, SPS Agreement, transparency, harmonisation, scientific assessment, regulatory autonomy. ABSTRACT: Since its accession to the WTO on 11 December 2001, China has been involved in eight cases as complainant, 23 as respondent, and 89 as a third party. Against all pre-entry predictions, the China-related cases have not overburdened the WTO dispute settlement system, as if all parties were implicitly respecting a latent period before engaging in commercial hostilities. Often portrayed as a “passive rule taker” in the immediate aftermath of its accession, China was not only learning by attentively watching other members’ strategies, but also benefiting from the benevolent attitude of its main trading partners, the US and the EU. Moreover, its participation in 89 WTO disputes as third party is not a trivial detail nor is it a sign of passivity, but rather one of cautious preparation that corresponded to the time needed to properly apprehend its new legal tools and all rights thereunder. 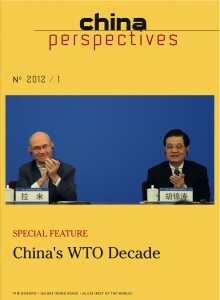 While there are many ways of approaching such an already vast body of decisions and related legal and economic literature, this article tries to reflect the uniqueness of the Chinese trade regime and the impact of such a peculiar mix between economic libreralisation and maintenance of the state on other WTO Members in addressing the following questions: the transitional product-specific safeguard measures adopted in reaction to a market disruption caused by Chinese imports, the antidumping and countervailing duties issue, and the restrictions on exportations or importations imposed by China for economic, but also societal and political reasons. KEYWORDS: China, WTO, Dispute Settlement, Safeguards, Dumping, Subsidies, Imports and Exports Restrictions. ABSTRACT: In November 2001, China finally acceded to the World Trade Organization after a marathon accession negotiation that lasted 15 years. As China’s accession coincided with the launch of the Doha Round, many commentators predicted that China’s participation in the trade negotiations would have significant impacts on the Round. However, this has not proven to be the case. What have been the approaches taken by China in global trade negotiations? Why did China adopt these approaches? How did China’s different negotiating approaches affect the dynamics of trade negotiations? These are the questions addressed in this article. The paper argues that China started as a reluctant player in the negotiations, and only gradually made its way into the core decision-making group of the WTO rather late during the round. Even though China has now been accepted as a member of the G-7, the most powerful group in the WTO, it has been playing only supportive rather than leading roles. The article explains the reasons for such low profile approaches, and also examines the value of Chinese proposals from both quantitative and qualitative perspectives. The article concludes with some thoughts on the broader implications of China’s growing power in the WTO as a whole. KEYWORDS: China, WTO, Doha Round, Market Access, Trade Negotiation, International Trade, International Law, Accession. The novel Yu sheng 餘生by Wu He 舞鶴(Dancing Crane, the pen-name used by Ch’en Kuo-ch’eng 陳國城), first published in 1999 in Taiwan, has become something of a literary myth in certain circles, the work of a writer showered with prizes in the 1990s after re-emerging from ten years of reclusion in Tamsui. Born in Chiayi in 1951, Wu He lost his mother at 18 and began studying engineering at Cheng Kung University before transferring to the Chinese department in 1973. He was revealed to the literary scene with the publication of his first novella “Peony Autumn” (Mudan qiu 牡丹秋, included in the collection Sadness/Beishang 悲傷). He then became strongly involved in the literary journals associated with the Taiwanese “modernist” movement, in particular the “Avant-garde” series (Qianwei congkan). After having belatedly served out his military duties in 1979-1981, he lived in reclusion during his “ten years in Tamsui,” during which he wrote several other novellas, including “The Two Deserters” (Taobing er ge 逃兵二哥; also included in Sadness ), which were only published after his “return to the world.” When he moved back to the south of Taiwan in 1991, he notes that he seriously considered a final retreat to a Buddhist monastery before deciding that he could not renounce literature. Book reviews can also be consulted independently on dedicated webpages. Please see below.